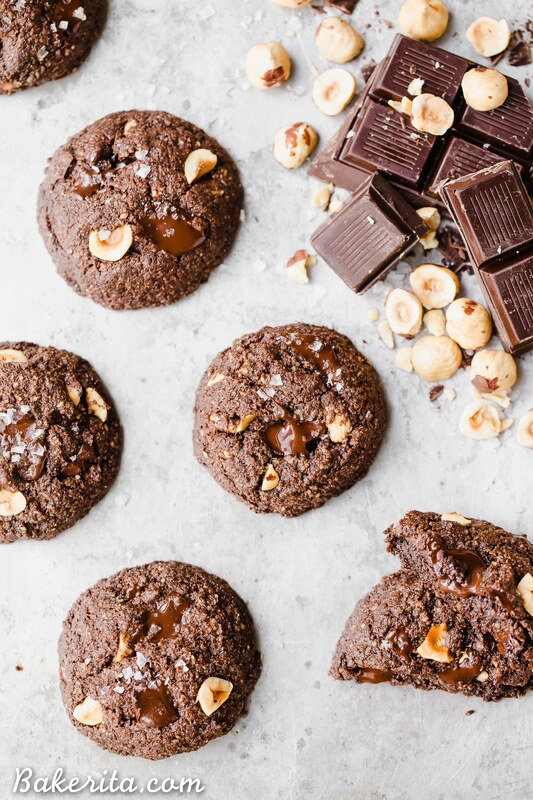 These Double Chocolate Hazelnut Cookies are soft, fudgy, and incredibly chocolatey! 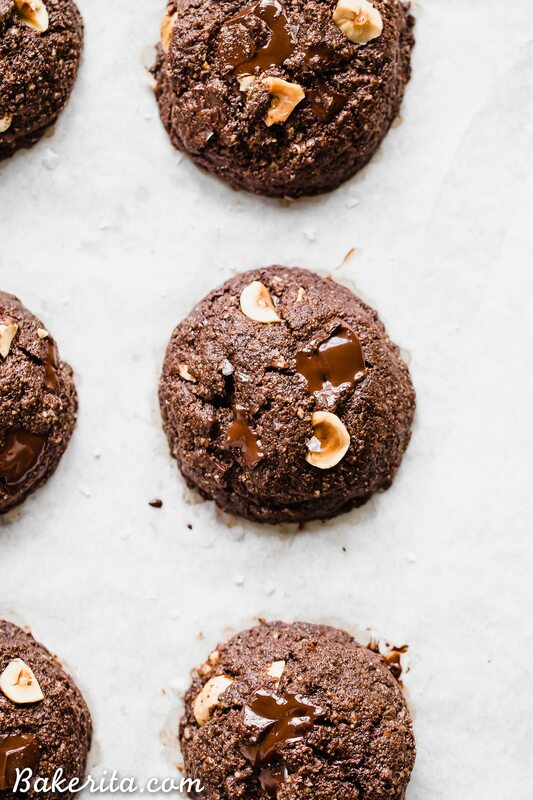 These irresistible cookies are loaded with melty dark chocolate chunks and crunchy hazelnuts, and you’d never guess they’re gluten-free, paleo, and vegan. This post is sponsored by Bob’s Red Mill. I think it’s safe to say I’ve eaten at least 10 of these cookies in the past few days. These Double Chocolate Hazelnut Cookies are so dang good, I just couldn’t STOP myself. I think I may have eaten even more of these than I did the last time I had a batch of these Paleo Chocolate Chip Cookies in front of me. The second batch of them that I tested were cookie perfection. Perfectly soft and gooey, with melty chocolate, crunchy hazelnuts, and a rich, deep chocolate flavor. I ate one fresh from the oven and was the happiest little clam ever. Then, I left these Double Chocolate Hazelnut Cookies out alllll day long, and forgot to cover them or put them away before I went to bed. The next morning I took a little piece and expected it to be a little dry and not as good. NOPE – they were still just as soft and tender and delicious as when they came out of the oven. I brought these cookies to my dads, where we devoured them over the course of the weekend. They stayed just as moist and decadent as when they came out of the oven. Pretty much magic, right? On Saturday, I convinced my dad to drive an hour and fifteen minutes out of San Diego to go on a hike in Julian. I brought Hank and we traversed the most beautiful green hills and mountains for 9-miles, even meeting some cows along the way. Needless to say, when we got home, I wanted a Double Chocolate Hazelnut Cookie bad. After I hiked for 9-miles, so I let myself have two.  Five days after they initially were made, they were still heavenly. That was the end of them, so, unfortunately, I have no day-six report, but I think they’d still be delicious. 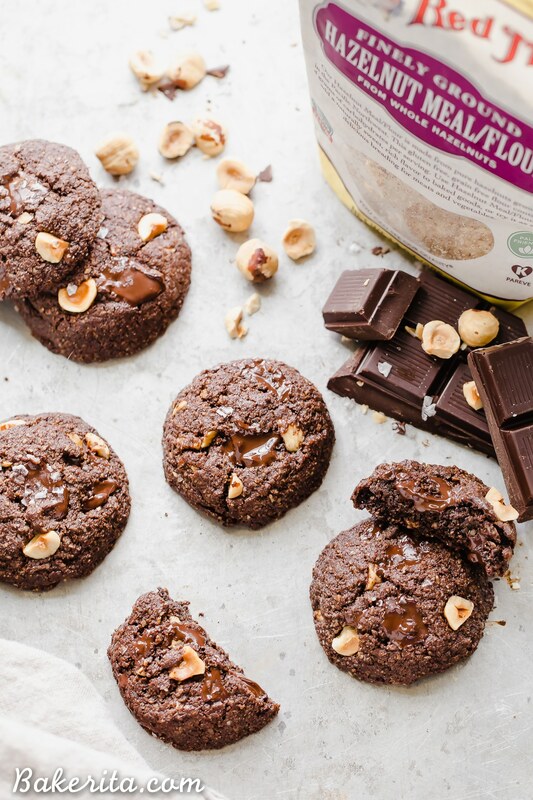 These are a MUST MAKE for any Chocolate Hazelnut Cookie fans! If you have any left after six days, I’d be pretty dang surprised. They’re too irresistible for that! They’re almost brownie-like in how chocolatey and fudgy they are. Because they use hazelnut flour in addition to the almond flour, they have a sweet, nutty hazelnut flavor. My hazelnut flour (and almond flour) is from Bob’s Red Mill, who you guys all know makes all my favorite flours. They’re always high quality and if Bob’s makes it, it’s probably my go-to. 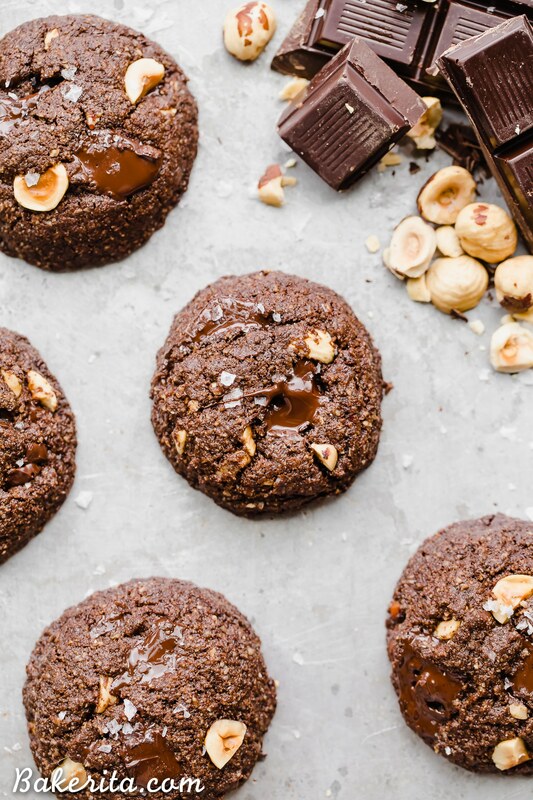 These Double Chocolate Hazelnut Cookies are soft, fudgy, and incredibly chocolatey! 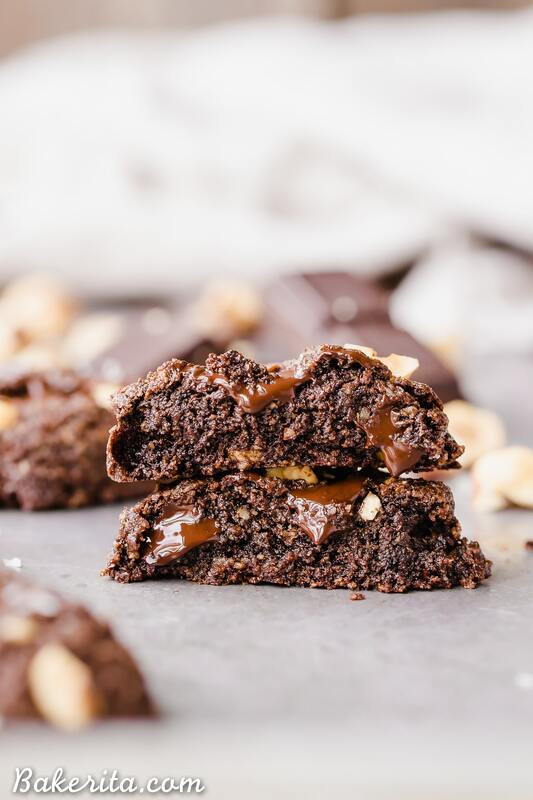 These irresistible cookies are loaded with melty dark chocolate chunks and crunchy hazelnuts, and you'd never guess they're gluten-free, paleo, and vegan. Add the cocoa powder, almond flour, hazelnut flour, salt, and baking soda to the wet ingredients. Mix until well incorporated. Fold in the chopped chocolate and hazelnuts. Use a cookie scoop to form cookies and place on a parchment-lined baking sheet; press down slightly. Place in the refrigerator for an hour if you want thicker cookies (I did this), otherwise, you can bake right away. When you're ready to bake, preheat the oven to 350ºF. Before baking, sprinkle with flaky sea salt if desired. Bake for 10 minutes or just set. If you don't have hazelnut flour, you can use all almond flour instead. Thanks to Bob’s Red Mill for sponsoring this post. As always, all opinions are my own. Thank you for supporting the brands that support Bakerita! These look so good!! Could we make them without the hazelnut flour and use something else instead? Hi Kristen, yes for sure! You can use all almond flour if you don’t have hazelnut flour. How long would you say these cookies last? The reason I ask is because I would like to send some overseas. Hi Sthefany, they stayed super soft and delicious for 5 days here – they didn’t last any longer than that, but they were still soft and delicious on that last day! I’m thinking they’ll be fine to ship overseas, just make sure they’re wrapped tightly so they don’t dry out. Enjoy! I’m allergic to almonds so I’ve always substituted hazelnut in your almond flour chocolate chip cookies! Now they are the most requested cookie ever! I’ll have to try to this with the cocoa powder! Oooh I’ll need to try that one with hazelnut flour too! Sounds so good. I hope you love these as well, and as you know, you can certainly use all hazelnut flour here. You mentioned in your stories that the cookies didn’t spread out at first. I am curious to know how did you solve that ? I just made these cookies amd they are very similar to ones I make however I found these to be very oily. Perhaps the amount of coconut oil needs to be revisited. I put them in the fridge firm up and even so they just flattened to a very thin cookie. They taste fine but still quite greasy. I made these last night and they were delicious and very simple to make. I didn’t find them oily at all , they were very firm. So glad you’re enjoying them, Alison! Thanks so much for the feedback. Could I use regular sugar instead of coconut sugar, and regular butter instead of coconut oil? Haven’t tested that way but it should be fine!